Forget the destination, it’s all about the journey. I play games for a lot of reasons. Sometimes I want to be told a story or chase high scores. Other times I want to master deep systems or escape into another world. That’s why I love the medium. There’s a game for every occasion, every mindset, and every mood. It’s a beautiful thing. Over the years I’ve fallen in love with what I call ambient games. Freeform, laid-back, open-ended experiences that you can lose yourself in for a few hours. Games, or parts of games, that are slow and measured, with no pressure to do anything in particular. Like a screensaver for your brain. This could be going on a cross-country road trip in Euro Truck Simulator 2, scanning planets in the cosmic depths of Elite Dangerous, rambling around Proteus’ psychedelic island, planting crops in Stardew Valley, or taking soil samples with your rover in Take On Mars. Games like this give you a chance to dim the lights, sink into your chair, put on headphones, and drift away from reality for a while. The videogame equivalent of listening to a Brian Eno album or taking a long, hot bath. And this is why I love the colourful procedural universe of No Man’s Sky. Some people don’t love No Man’s Sky. It’s one of the most divisive releases of the year so far, splitting critics almost down the middle. And while I agree with a lot of their complaints, I still really like it. Because I realised that it’s not a game to be finished; it’s an experience to be had. Part of the problem is, I think, expectation. The hurricane of hype surrounding the game undoubtedly painted an inaccurate picture of it in people’s heads. They expected a deep, complex sim like Elite, and instead they got a weird, arty, minimalist space exploration game with crafting. And if you start No Man’s Sky with that mindset, you’re almost certainly going to be disappointed. Its core loop of harvesting resources, building things, and crafting fuel to travel deeper into the galaxy is shallow—especially compared to the unfathomable breadth of its setting. But when you stop caring about reaching the centre of the galaxy, following the Atlas, or whatever path you’ve chosen, you start to appreciate what really makes the game special. Because while you’re furiously mining zinc on some moon to craft warp cells, you're not having an adventure. I love science fiction, because it fires my imagination in a way no other genre does. In Arthur C. Clarke’s novel 2001: A Space Odyssey, in a chapter titled The World of the Gods, the Discovery passes Jupiter and sends a probe into the massive, chaotic storms raging in its atmosphere. The way Clarke vividly describes an “endless sea of mottled gold” and how it’s so alien that it’s “meaningless to eyes accustomed to the shapes and colours of Earth” has always stuck with me, because it makes you realise just how terrifyingly, infinitely unknowable space is. And, for me, No Man’s Sky captures some of this sci-fi magic. It makes me feel like I’m voyaging into the unknown, a speck of dust floating in a vast cosmos. But to appreciate the game on this level you need to take some responsibility yourself. You need an imagination. It’s easy to see the game’s joins. Sometimes literally when you’re approaching a planet and the landscape pops into view. You see two aliens, each with slightly different horns or tails, and you can determine how the procedural generation tech has conjured them up. But if you suspend your disbelief, take it on its own terms, and buy into the game’s universe, you’ll enjoy it a lot more. If you want a polished, nuanced, deep game, look elsewhere. I’ve found that No Man’s Sky is best enjoyed at a leisurely pace with no specific goal in mind. When you land on a planet, don’t feel pressured to analyse every creature and spend ten minutes mining giant chunks of of gold and aluminium. Have a look around, and if you don’t like it, fly away. There are still another few quintillion to visit after all, and life’s too short. Don’t fret about ‘finishing’ the game, because whatever lies at the core will never live up to the idea you have in your head. Make some progress here and there, sure, but don’t make it your driving ambition. Stop and smell the roses, but don’t destroy them or you’ll make the Sentinels angry. You’ll inevitably see a lot of unremarkable planets as you explore, but persevere and there are incredible sights to behold out there. I’ve seen sunsets casting surreal coloured light over toxic deserts, herds of weird creatures grazing on plains of turquoise grass, and immense water-worlds looming on the horizons of rocky moons. Basically, stop worrying. It doesn’t matter if the mining and crafting are repetitive or that you’re still light years away from the core. Or that there are a lot of similar-looking planets that sometimes pop awkwardly into view as the procedural generation struggles to keep up with your ship. Pour yourself a drink, turn the lights down, maybe put some music or a podcast on, and go for a lazy expedition among the stars. 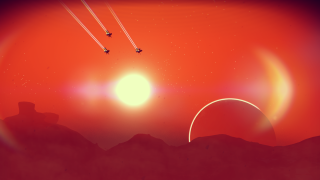 No Man’s Sky is far from perfect, and there are much better space sims out there, but as a game just to relax to—and which captures the evocative mystery of classic science fiction—it’s a wonderful thing.